Our Prime Minister Lee Hsien Loong is a boss. Well, in the literal sense, if Singapore were a company, but we’re also talking about how he owns what he does with confidence. Last night’s incident only demonstrated his willpower to finish what he started with equal, or even more gusto. The unexpected break when PM suddenly took ill during the Rally gave us all a shock (a gross understatement), and we waited with bated breath for updates. The heart-wrenching moments before the camera cut away from a visibly weak PM Lee was replayed over and over, with many trying to CSI their way into what had happened. 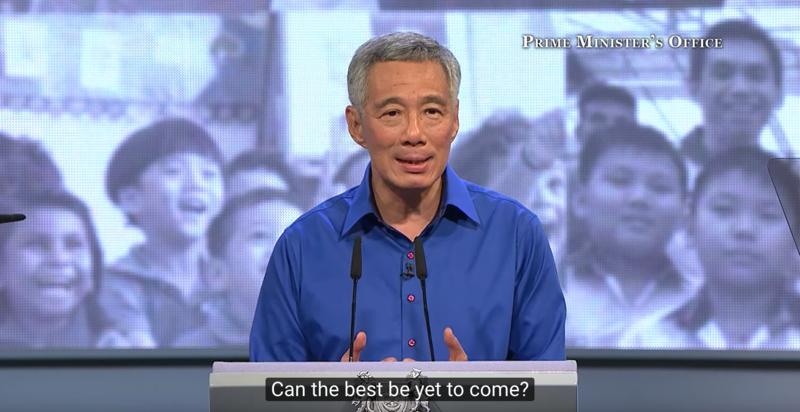 As updates about this condition trickled in, the load on our shoulders was slowly lifted, but what took the cake was when Deputy Prime Minister Teo Chee Hean announced that PM Lee would return to deliver the rest of his speech – #likeaboss. 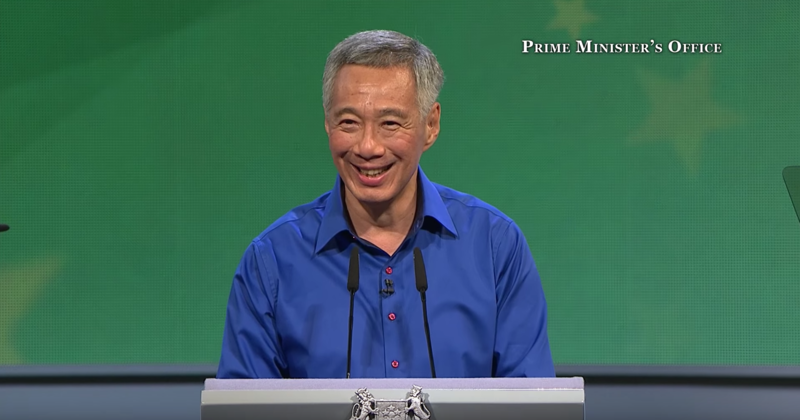 After an agonising wait, PM Lee appeared on the podium again, with his signature smile. While I could go on about this, I’d like to take this time to reiterate how our PM owned not only the incident, but the entire Rally #likeaboss. #1 How Do We Get To Where We Want? Just like our National Anthem, PM Lee started off with how Singapore can move onward into the future. With high technology penetration rates, world-class infrastructure and a highly-skilled and educated population – we are on the fast track to standing amongst the big brothers like Tokyo, Shanghai and New York. However, we do not want a nation that only knows of progress and material rewards and comfort. PM Lee notes that the challenge also comes in making Singapore feel like a home – “Where we belong, where our families feel safe and secure”. He also emphasises the need to build a compassionate and inclusive society which leaves no one behind. He then poses the question: “We know what we want, but how do we get there?”. 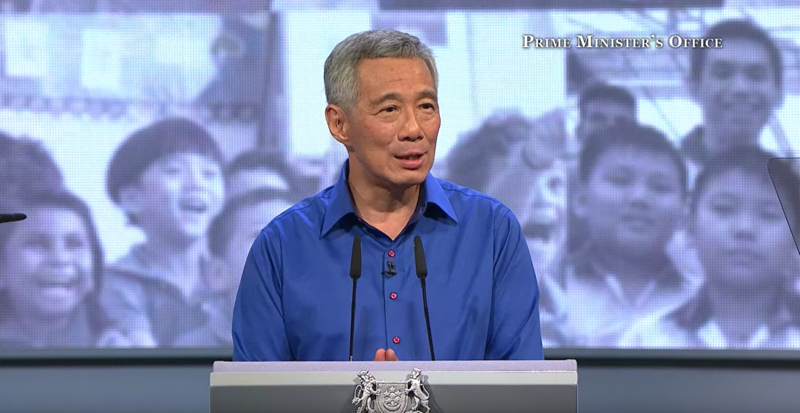 Now, if this question were to have come at the end of the speech, we’d all probably be left hanging, but to put it at the start of the Rally only meant one thing – PM Lee wanted to address and work towards challenging these challenges head on. ‘Disruption’ used to be negative in connotation – usually implying that an unwanted deviation took place. However, the term is getting a more positive reputation, and many do not realise that the changes around them are actually forms of it. PM Lee talked about how traditional industries are constantly being disrupted and quickly replaced by smarter alternatives, and how these older business models and their workers are thus left in the dust. While closing ourselves off and imposing restrictions may help the older industries and their workers temporarily, it is not the solution in the long run. There is just no stopping the penetration of technology. Instead of protectionist measures, PM Lee suggested new methods of integrating both their present strengths and what progress can do for them. For example, Singapore could be a major player in the logistics chain given its transport and financial hub status, while we may lose some, say, in the retail industry. 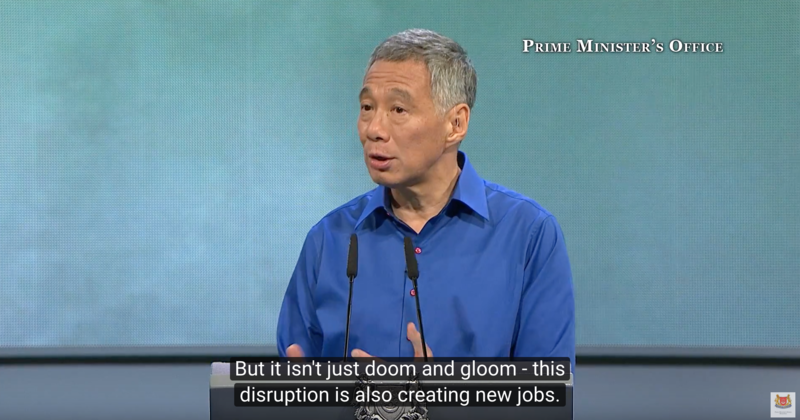 If you were to think of Singapore and PM Lee as your employer, would you rather a boss who keeps you and your skills locked away like a hermit, or would you rather one that pushes you to expand your capabilities to deal with disruptions? Going even more digital isn’t going to be that difficult or foreign for us – Singaporeans are quite the IT-savvy bunch. A relevantly skilled workforce is necessary in building a strong economy, but this would also mean that workers need to be taken care of, so that they can rise in their careers, be adaptable to disruptions and practically speaking, also earn better pay. PM reminded us that SkillsFuture has been introduced so that Singaporeans can keep up-to-date with skills for future jobs. With the increasingly gloomy job market, helping retrenched and out-of-job workers, especially mature workers, is all the more important. He mentioned the Professional Conversion Programme and Career Support Programme that are helping these individuals pick up new skills and potentially move into a different industry as well. 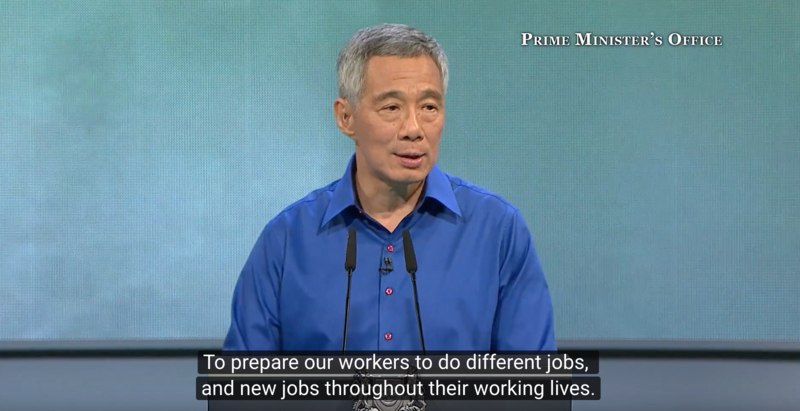 PM Lee also commended NTUC for doing a good job helping not just rank-and-file workers, but PMEs too. NTUC is also reaching out to freelancers and self-employed workers – an increasingly common working arrangement. These new worker segments need help and protection too. He wasn’t afraid to present the harsh realities, and remind us to not rest on our laurels. Being single-skilled is no longer enough, and it’s important to second, and even third-skill to maintain our competitive edge. SkillsFuture and NTUC’s efforts will act as a means for us to maintain our employability, but the onus is also on us to leverage on them. This one’s for the startups and entrepreneurs. PM Lee sang high praises of these individuals’ resourcefulness and optimism, they live out the motto of “anything is possible”. He knows of Block 71, an incubator for startups, which has since expanded to two more blocks, and even internationally – in San Francisco. This is strategic, as the SF branch can help us tap into the US market and Silicon Valley (aka the mecca of startups) network. To encourage the spirit of entrepreneurship among our younger generation, in-school students are also given a chance to interact with international startups through overseas exchanges and internships, and he hopes that through that, young Singaporeans can “start up something, and try to change the world”. As a writer in Vulcan Post, our features on local Singaporean entrepreneurs always do well, with many readers proudly sharing the stories of how their fellow country(wo)man went against all odds (and conventional paths) to create a startup that’s not only cutting-edge, but helps our society as well. PM Lee’s endorsement of confidence in the startup scene and his bold hopes that we’ll have the next Google, Facebook or Alibaba from a local will definitely give me more work to do because there’ll be more entrepreneurs to feature, but that, to me, is a happy problem. Perhaps one of the heaviest subjects of the night was on terrorism. 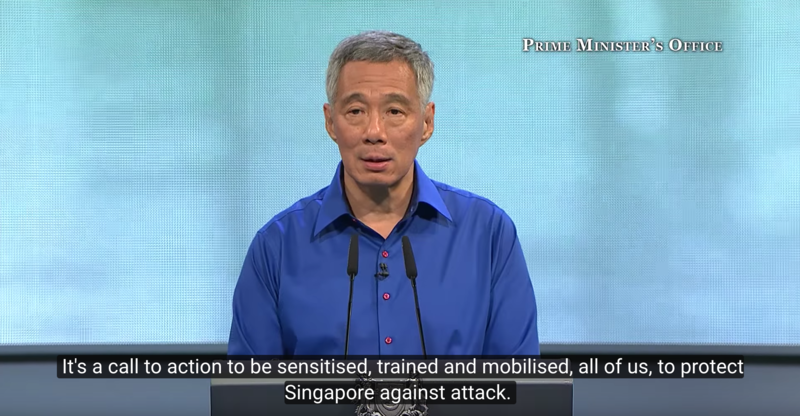 PM Lee conceded that attacks are impossible to prevent, especially with the rise of ‘lone wolf’ attacks by self-radicalised individuals. He also reminded us about the arrests of Gigih Rahmat Dewa and his group in Batam, who were planning to attack Marina Bay – but they are simply one group out of many who are potentially aiming to attack us. Our neighbouring countries have been experiencing the brunt of extremist threats, and unfortunately, Singaporeans are also not immune to propaganda. Take the news of a Singaporean who was detained under the Internal Security Act (ISA) for his promotion of ISIS on Facebook and attempts to radicalise others (which he actually had succeeded in), and the even more recent one on four Singaporeans being detained for their plans to join ISIS in Syria. He reminded us that if an attack happens, how we react as a nation could go two ways: we react as a collective and stand together; or we distrust and fear each other – and it all boils down to how prepared we are as a nation. While our religious and community leaders have openly condemned terrorist attacks and made clear that the black sheep do not represent their religion, it is also up to the rest of us to respect each other, and realise that a few bad eggs do, and should not, spoil the entire batch. Their support of the move to make the Asatizah Recognition Scheme (ARS) compulsory for all local Islamic religious teachers is also crucial to helping making Singapore safer. The topic is not one that is easy to talk about, especially since he himself is under the threat of being attacked. However, PM Lee called it for what it was and shared honestly with the nation what the Government had found out, and what they have been doing. The threat of terrorism doesn’t only come from a particular group. Anyone, regardless of ethnicity or religion, can be radicalised. While we should have faith that we have the capability to manage the risk of terrorism, we need to stay vigilant and united as a people. Another difficult, but necessary, issue to address was that of race relations, and how ‘colour blind’ we are (or are not). The recent poll by Channel NewsAsia and the Institute of Policy Studies (IPS) revealed both good and not so good results: While the majority embrace meritocracy, many still prefer a President from their own race. Many also agree that racist attitudes still exist, nearly half have heard racist comments at the workplace. We have come a long way, and we have come so far not by ignoring or sidestepping the differences – but despite the progress we have made, we are still not race-blind. PM Lee brought up the issue of having a head of state who is of a minority group, and how such attitudes could be a disadvantage to the minority candidate. 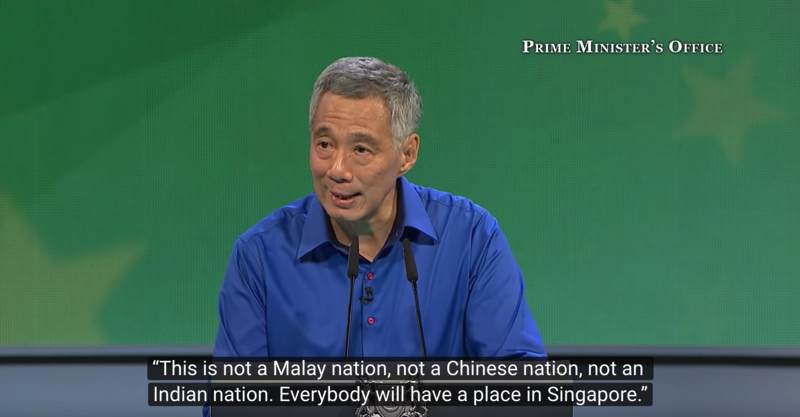 In light of this, he spoke about how “we want a minority Singaporean regularly to become President, to represent what we feel about Singapore, and our ideal of a multi-racial society.” Yes, there will be coming changes for our elected President system. Thus, PM Lee had to stand even more firmly on current policies, even if it means they are seen to be intrusive (like ensuring a certain ratio of races in a block of HDB flats). This is a point that hit close to home, especially with the unforeseen incident yesterday. Admitting candidly that time in office for him and his senior colleagues would inevitably be up soon, he is extremely concerned about succession planning. There is urgency to form a core team which is capable, committed and holds integrity close to be able to take over. He also mentioned that National Development Minister Lawrence Wong would be stepping in as a second Finance Minister to lighten Finance Minister Heng Swee Keat’s load. Let us first marvel at how quickly he bounced back from his unintended break – I saw many calls on social media asking him to postpone the rest of the speech to another day, but against all odds and pleas, he swiftly got back on stage and finished the speech #likeaboss. With challenges ahead, the only way we can take them on is to prepare, prepare, and prepare, including succession planning. Because you know, life is unpredictable. Last night’s incident only proved to us one thing – he owned not only the Rally, but our hearts as well.